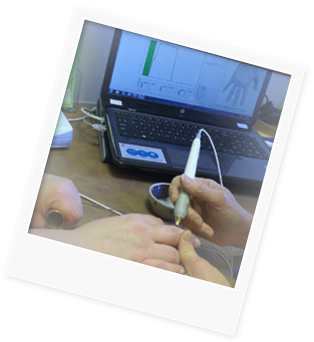 The Downing Clinic has offered electrodermal (EDS) biofeedback screening for many years. With the EDS software and a computer, the specialist tests energy signals in the body. Signals sent on known acupuncture pathways can help determine whether a particular system is stressed or fatigued. The specialist provides clinically useful information and works closely with Dr. Kovalcik to suggest lifestyle and dietary pattern changes. Our trained specialist, Ann Heusted, RN, works with Dr. Kovalcik to test patients for such things as food and environmental allergies and sensitivities, presence of toxic metals, and then recommends and tests homeopathic remedies, nutrients, herbs that may help an affected system. Follow-up screenings help determine progress. Dr. Kovalcik offers guidance as to what is to be tested, and areas of possible problems. Ann has been with the Downing Clinic since 2005 and is certified in EDS screening. FirstLine Therapy, and is an RN.